Do you have an old will? Life – What has changed in your family, your health or your finances since your last will was created? Law – What legal or tax changes have occurred in federal or state law since your will was drafted? Learning – What have you learned since your last will about your family and how they handle money? What legal strategies do estate planning attorneys have now that may not have been available or common when you did your last will? Changes in the laws or tax laws since you did your Will could cause complications or unintended consequences. 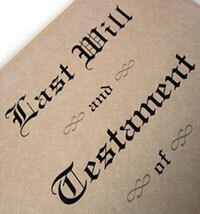 Wills are designed to go through probate. The extra expense, delay and public exposure that go with a court probate process may be avoided when other estate planning tools are used. Many Wills do not have adequate provisions for protecting the inheritance you leave to your loved ones. Risks such as future divorces, lawsuits and financial struggles can be mitigated with proper planning. Is the executor you chose in your old Will still the best person for the job? When first choosing them did you consider how prepared they would be to do the job? Or will it be a struggle for them because of a busy schedule, lack of attention to detail or inexperience? Is your old Will coordinated with ALL of your beneficiary designations, joint ownership and account titling? Unless you are very intentional about your financial organization, the way you have set up accounts and insurance policies could undo the wishes stated in your Will. Have your life circumstances changed? Have you gotten married, divorced, had children or grandchildren since your last will was drawn up? Is your wealth greater or lesser than it was before? Have you planned for possible nursing home costs? Even if your old Will is okay right now, your wishes could be undone if high nursing home costs eat up most or all of your savings prior to your death. If you found that any of the above circumstances apply to you and your situation, give us a call today at (217) 726-9200 to schedule an Initial Meeting, find out workshop dates to learn more or read more about how to get started HERE.